Over the past year, we’ve seen Samsung go deeper than any other manufacturer when it comes to diversifying its line of smartphone related products. Diving into yet another totally new segment, the smartwatch one, the Samsung Galaxy Gear is looking to take the field by storm – as it’s one of the first to take a swing at the market. It’s an interesting little gadget, since it combines the timeless function of a watch with the depth of features in a smartphone – so we’re intrigued by this peculiar concoction. It seems practical, but is it really? Before we begin, it's worth mentioning that, at first, the only device that the Galaxy Gear will be usable with will be the Galaxy Note 3. Samsung is expected to roll out software updates that will enable the Gear to work with the Galaxy S4, Galaxy S III and Galaxy Note II. Whoever designed the Samsung Galaxy Gear better be working on a smartphone next for the Korean giant, seeing that it’s considerably more premium than any of Sammy’s own smartphones and tablets. It could’ve been a toyish looking watch, but the folks behind the design gave the Galaxy Gear a very pleasant and sophisticated look. Although the majority of the body is made out of this sturdy plastic material, the front casing is actually comprised out of stainless steel, which is further accented by the bolted screws on the corners of its casing. Obviously, there’s no arguing the level of premium that’s attached to it. At first glance, the thick plastic wrist strap might seem out of character, but it’s necessary because it tucks away ribbon cables that are used to connect the camera and speakerphone to the body of the watch. 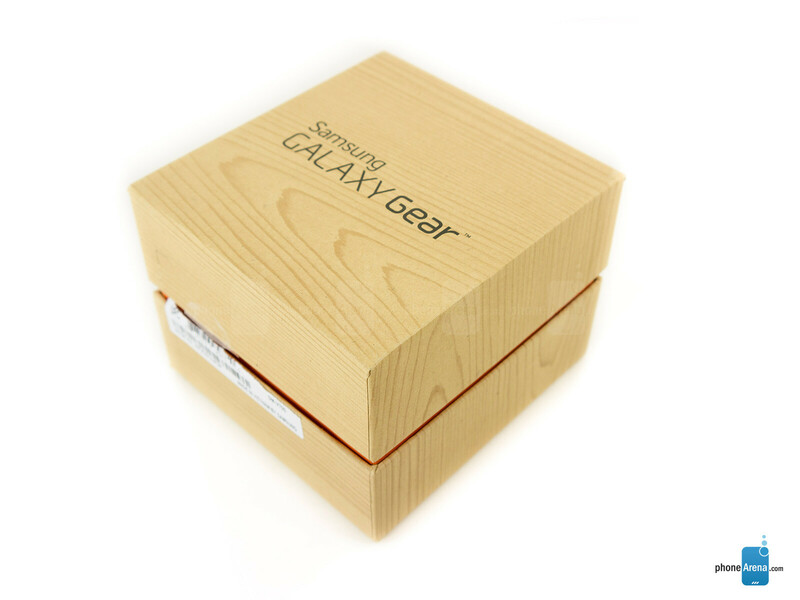 Depending on the color of the strap, it can either enhance the look of the Galaxy Gear, such as the darker colors, or oppositely, make it appear more toyish in nature. 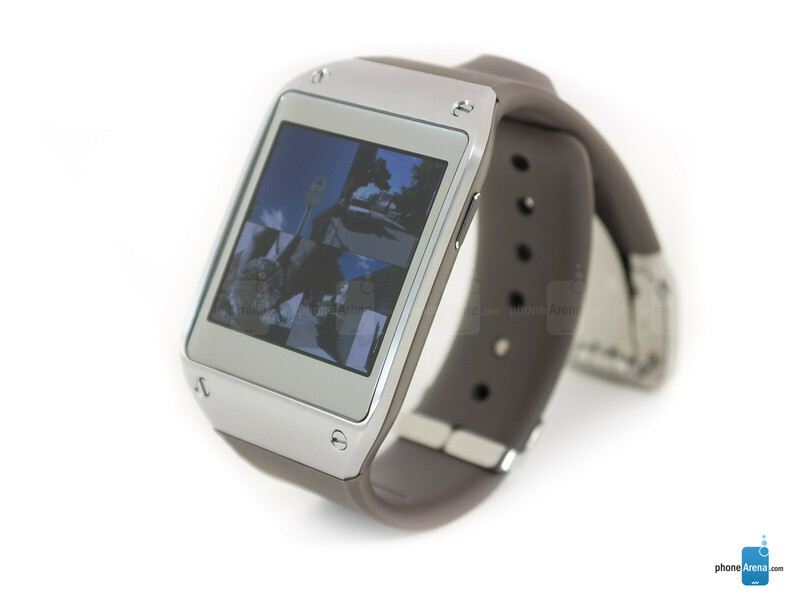 With our specific dark brown review unit, it perfectly accentuates the steel finish of its casing. Thankfully, the strap is adjustable to fit any sized wrist – so it doesn't feel too irritating when it’s used for a prolonged period of time. In terms of size, it’s definitely on the big side, but then again, watch connoisseurs are probably used to watches that are even bigger than the Galaxy Gear – so there’s not much of a worry here. Overall, we’ll give Sammy credit for the design with this, seeing that it’s absolutely gorgeous looking. Taking a look around the Galaxy Gear, there’s only a single physical button on its casing – and it’s the multi-function button on the right side of the watch. It’s raised, and has a decent amount of feedback when pressed, but its functions vary. Pressing it once turns it on, while double pressing it by default activates its S Voice feature. 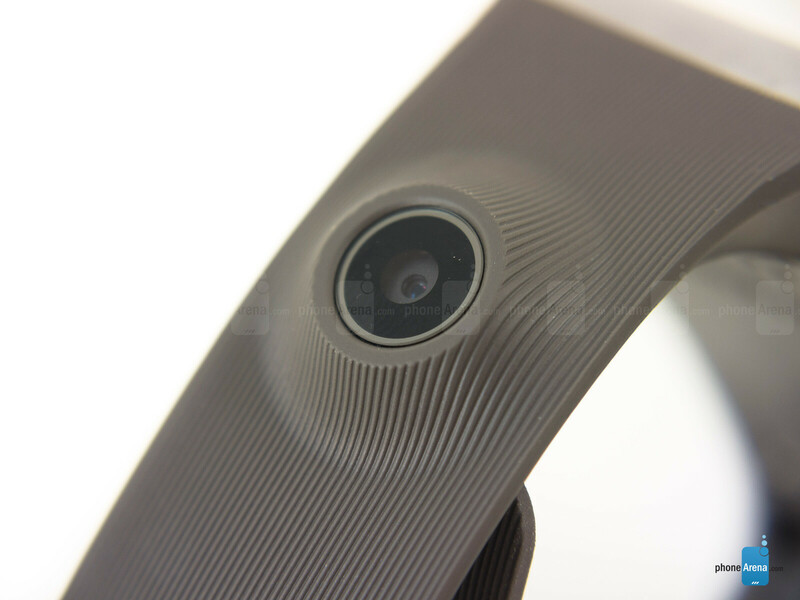 Along the top section of the wrist strap, there’s a recognizable hump that tucks away its 1.9-megapixel auto-focus camera. 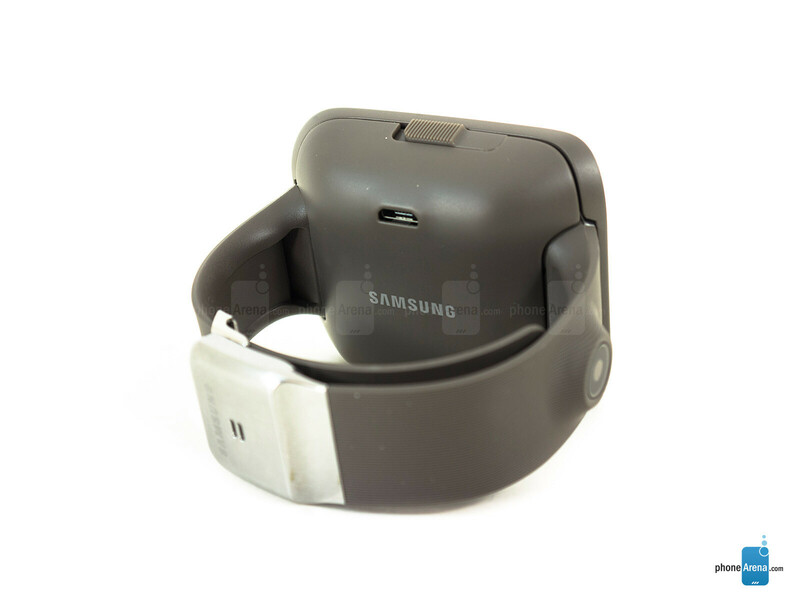 Meanwhile, the locking mechanism of the Galaxy Gear also houses a speakerphone, which is used in conjunction with phone calls and notification tones. It’s hard to see it, but there are actually pinholes on the left and right edges of the casing. Around the back, there are 5 gold plated circles that work in conjunction with the included cradle adapter to charge the smartwatch. Indeed, we would’ve preferred seeing a microUSB cable built into the Galaxy Gear itself, but it would’ve more than likely increased its size or thickness. We almost forgot to mention it, but the Galaxy Gear is NOT water resistant – so you really don’t want to get this wet. Knowing this, we’re a bit perplexed as to why it isn’t, seeing that watches as a whole are meant to be worn and forgotten about, unless you need to know the time of course. Meaning, we’re required to remember taking it off before showers, when washing the dishes, or simply taking a stroll if it’s lightly raining. Trust us, you don’t want to fry this one on the first day. 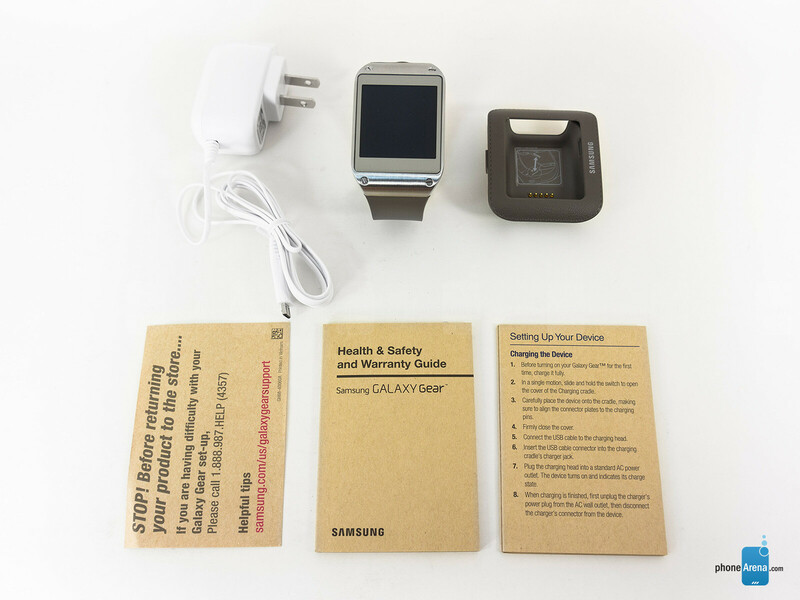 Getting the same love as its flagship smartphones, the Galaxy Gear is outfitted with a 1.63-inch 320 x 320 Super AMOLED capacitive display. Yes, we’ll point out that it’s a tiny thing when compared to smartphone displays, but for a smartwatch, it seems to be the right size actually. Heck, it’s pretty detailed for its size too – enabling us to even read emails with little difficulty from a normal distance away. Utilizing AMOLED technology, it naturally exudes all the distinctive characteristics we all know and love - it has that pitch black tone, colors have an over-saturated nature, and its viewing angles are simply superb. Sadly, the display is difficult to view outdoors with the sun present. Certainly, “outdoor” mode helps to give us better contrast outside, but the same end results continue to persist. Interacting with the display is a hit or miss experience, seeing that it sometimes has a delayed response with certain actions. Swiping between the homescreen is pretty intuitive and straightforward, but pinch zooming or double tapping the screen sometime requires multiple tries to get right. If you’re worried about scratches diminishing the look of the Galaxy Gear, you can sleep easy knowing that it’s protected by the layer of sapphire glass over it – giving it a very slick feel to the touch. Heres another contentious con - it's pointless. Like Your Opinion Is The Only One That Matters... For those of us who appreciate companies (like Samsung) that truly endeavor to push technology forward rather than sitting around waiting for others to innovate device categories then STEALING Said Innovations (like Apple), the Galaxy gear is a bold first step for wearable communication. Anyway... This 'review' is so wrought with ridiculous biases and nit-picking that is almost laughable. 6.5 = WTF? Then again, this John V. character has shown time and time again his antipathy for all things Samsung. Making his opinion anything but credible. 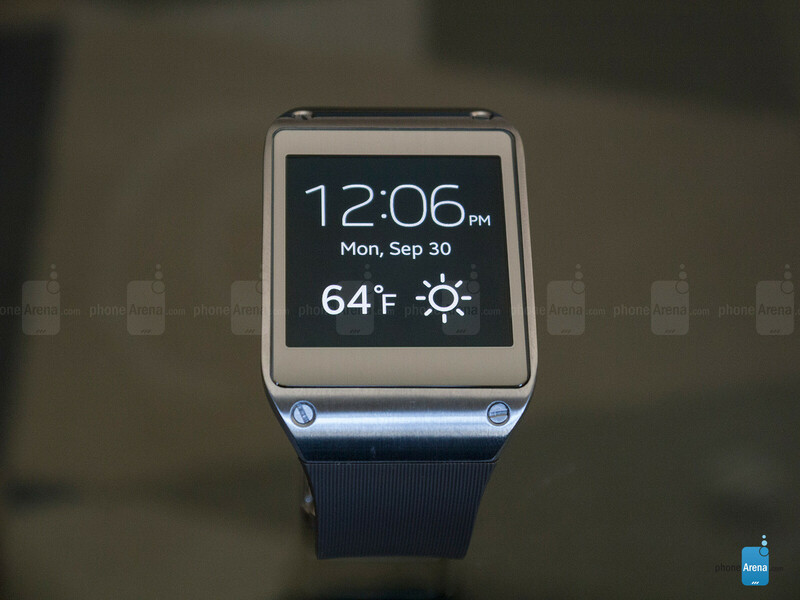 Can hardly wait to buy the Galaxy Note 3 + Galaxy Gear next week - Real Technology for Real Tech Lovers! Hey I love technology just as much as the next guy, and maybe the super geeks will find some use for this, but for the majority, its going to be a huge fail and is unlikely to sell in large quantities. Wearable tech will be awesome when it is done properly; this however appears to have been rushed out just to be the first on the market, by a CEO who thought he was some kind of Power Ranger when he unveiled it at the Unpacked event. I don't agree that Samsung truly push technology forward either. What have they done that has been truly revolutionary recently? They try, but everything just turns out to be a novelty that quickly wears off after a few days; and the less said about Apple stealing from Samsung the better. I hope you enjoy your Note 3 and Gear...The Note 3 looks like a good device. The gear serve me well too! Its pretty good for a first gen watch. Zoom in on John V con, Is it a CON in the first place. There no bugs in the software and that good enough for me. Even iPhone first gen has short coming remember no mms support no bluetooth support but hey! Apple fan can overlook any flaws from Apple while having a x5000 trillion magnification zoom on their competitor especially Samsung. The iPhone first gen was a 2G device. So what is your point? You will find most Apple users to be fair and objective. We are quite reason and won't use hyperboles. Have you looked at the iPod Nano 6th gen? Users were wearing that device as a smartphone, but it's never used to benchmark against the Gear? Why is that? Someone said "stealing innovations"? Well..http://www.cultofmac.com/136336/apple-sues-samsung-over-shameless-smart-cover-rip-off/ http://www.cultofmac.com/170727/samsung-is-now-shamelessly-ripping-off-the-design-of-the-mac-mini/ http://www.cultofmac.com/91126/side-by-side-comparison-samsung-vs-ios-homescreen-icons/ http://cdn3.sbnation.com/imported_assets/844649/2011-04-19applesam7.jpg And I can just go on..
Apple smart cover and LG/Samsung smart cover are different both visually and functionally. Apple smart cover just put the device to stand by which is great but Samsung LG one goes more. That's what innovation is about building on each other ideas. What Apple is trying to achieve is patent a circle and stop people from making wheels. joey_sfb, You really need to work on employing (sound) logic. Your arguments are specious and your use of corollaries is just dismal. 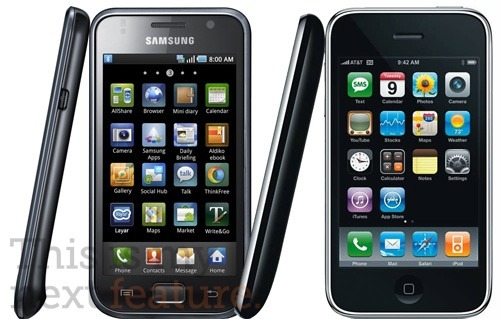 You have get over your denial -- here is a fact: A jury determined that Samsung stole IP from Apple. Therefore, it is no longer a case of my opinion or your opinion -- it is a fact adjudicated in a court of law. The Gear is not the first smart watch. While it may be the first gen smart watch from Samsung, it has several short comings, and many of these short comings are design related, planning related, etc. Plus, it's a very expensive device with (currently) limited usability with other smart phones. The bottom line is Samsung should have made a better smart watch before releasing the product. Again, in Samsung's case they used the iPod Nano 6th gen as a benchmark. In contrast, when Apple released the iPhone first gen, it was about introducing a new way of thinking about the smart phone -- the role of multitouch. While Apple didn't get many things right like using 2G data speeds, etc, they got multitouch right and that soon became the standard (look at Nokia or Blackberry that couldn't adapt) and just about every flag ship smart phone can trace its form factor back to the Apple iPhone first gen. The point is there was no benchmark for Apple -- Apple invented something the world has never saw before. We understand you hate Apple, and that anger is coming through your specious arguments. 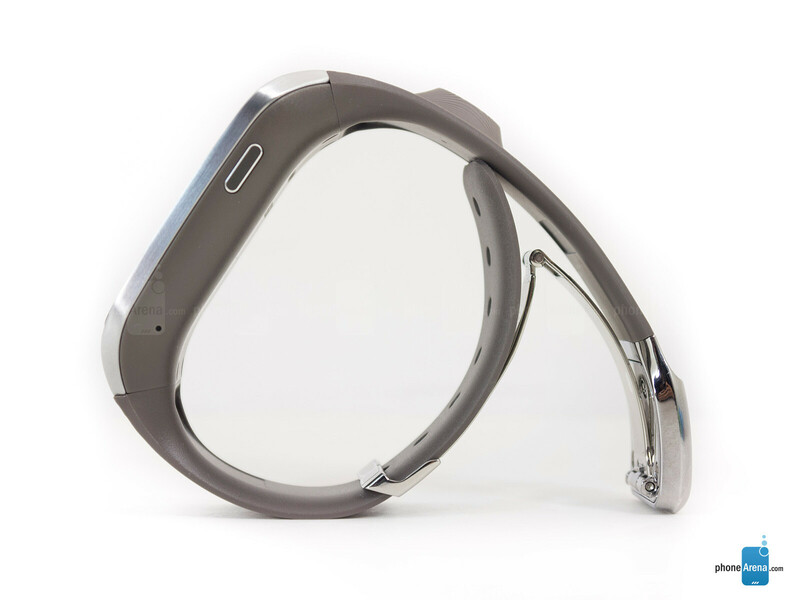 wait until apple will make a wearable tech .. 9.5 score i am sure. Typically I tend to stay away from the first generation of "new" technology. I bet the updated version of the Samsung Galaxy Gear will be 100% better than this "current" model. It's a good start but they are nowhere near where they want to be. See you this time next year Samsung. I am VERY content with my Samsung Galaxy Note III, that the Galaxy Gear can wait for the future model. Its a good try I will admit but the battery honestly disappoints me, I might forget to charge it one day and who is gonna feel bummed? Me! It's reeking of cons and it still gets a 6.5 . . .
One need take into consideration who wrote the 'review' as John V. never gives any Samsung product a truly fair assessment. Then don't buy one. There'll still be plenty of other who will. Jhon V.; Gear or both? Agreed about the water resistance for those who live in wetter climates (I don't), but as one who takes his watch off every night anyway, the full-day battery life shouldn't be an issue. It's good to see companies taking the first real steps in viable wearable technology, and as the owner of a (1st gen) Samsung smartwatch, the Pebble and Sony's first effort, the Galaxy gear looks to be the most capable yet... One well worth giving a try. Get the sony smartwatch 2.
www.gizmag.com/galaxy-gear-vs-sony-smartwatch-2-specs-comparison/29062/ An factual review of both Smart Watch 2 and Gear. Be your own judge. I've seen it in person. It's a convenient device, I just can't see paying $300 for it. It's also funny how the RAZR Maxx got so many negative comments about the price from the reviewer whereas the price of this is only mentioned once. Phone Arena reviews are such BS. John V's reviews are pure BS. But this x100.